CureMe is a free Windows 8 home remedies app available under ‘Health & Fitness’ section of its app store. 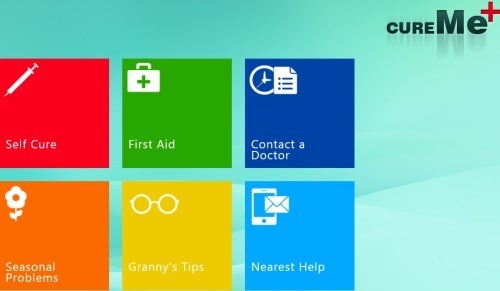 This home remedies Windows 8 app is basically a medical assistance that brings you tips for preventing and curing various health related issues. All these medical tips have been recommended by medical expects and highly experienced Doctors. The tips are completely home remedies, hence it does include any type of medicines. Self Cure: This section comes with home remedies tips for problems such as Acidity, Gastritis, Acne, Age Spots, Obesity, Sinusitis, Common Cold, Eczema, Mouth Ulcers, Nose Bleeding, Vertigo, Migraine, Stress, etc. First Aid: This section provides you quick remedies for problems such as Animal bites, Heart Stroke, Bleeding Gums, and Toothache. Contact a Doctor: This section lets you send your queries to the Doctors at the given email ID and the Doctors get back to you as soon as possible. Seasonal Problems: Here, in this section, you will find solution for common seasonal problems that you suffer from; in Winters, Summers, and Monsoon. Granny’s Tips: Here, you will get home remedies for Dandruff, Grey Hair, Hair Loss, Dark Circles, Common Cold, Skin Care, etc. Nearest Tips: This category brings you contacts and addresses of nearby Hospitals and Blood Banks. Well.. I really found this Windows 8 home remedies app very informative. You just think out of a problem and you get the simple Ayurveda solution here. Let me quickly point out the main features of this home remedies app for Windows 8 below. Brings you a collection tips for preventing and curing various health related issues. All these tips have been recommended by medical expects and highly experienced. There are six different categories including Self Cure, First Aid, Contact a Doctor, Seasonal Problems, Granny’s Tips, and Nearest Help. Lets you contact to a doctor via Email and doctors will get back to you with an effective solution. Lets you find nearby contacts and addresses of Hospitals and Blood Banks. Gives you first aid solution for various problems. Also, check out our posts on Beauty Tips Apps, and Home Remedies Apps. In order to download CureMe app in Windows 8, you need to open this link in IE10. Now, just click on ‘View in Windows Store’ to open the app in the Windows 8 App Store. Now, you can move further with upcoming installation instructions. All in all, CureMe is a good informative app which provides for a number of different problems along with the solutions. Its a must-have app, a perfect home remedy. Go ahead and download CureMe app in Windows 8 now.